Awhile ago, I was sent some free product coupons for a company called Eat Smart which sells all different kinds of cut vegetables and vegetable trays. Unfortunately, these are not sold within a 100 mile radius of me so I will be giving them away to 2 of you lucky readers. I did review these products a few months ago when the company sent some actual product to my house. 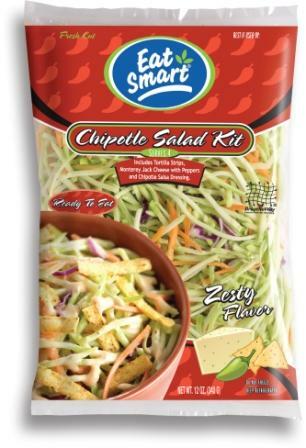 The veggies stay fresh forever and the chipotle salad kit below is my absolute favorite. My whole family loved it! 2 readers will each receive: 5 Free product coupons including: 1 free large vegetable tray, 1 small vegetable tray, 1 salad bag, 2 bags fresh cut vegetables. Follow my blog via Google Friend Connect & leave a comment below letting me know that you do. Giveaway will end on 8/9 and I will choose 2 winners. They will have 48 hours to respond to the email to claim their prize. Thanks so much for the healthy, nutritious giveaway! I follow you on GFC - Thanks! Following on GFC - Great giveaway too! I LOVE this giveaway. Not only the products which rock of course but the ease. I am GFC follower MyW1ldcrazylife! I'm GFC friend, Beth Elderton. I'd love to win. I follow you via GFC ! Thank you Amanda ! I follow via GFC as Terri P! Following via GFC under Jordan Dunne. Great giveaway! Thank you - love my veggies! That salad does sound amazing! I'm a GFC follower (Wendy). Natalie V follows GFC--thanks for the giveaway! My kids love fresh veggies with dips. I checked and they sell them near me so please enter me. following gfc as rachel b.
I follow you on Google Friend Connect as jaquerichards. :-) Thank you. I follow you via GFC (Erin Busymom). Thank you for the lovely giveaway! I follow you on GFC as sheila z.